Mitch McCarron of Melbourne (right) has warned against the reigning champions putting too much of a focus on Wildcats guard Bryce Cotton. 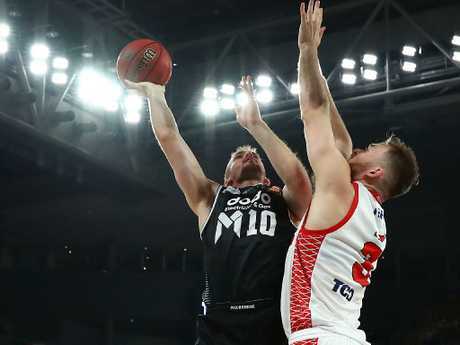 MELBOURNE United must disrupt Perth Wildcats in Friday night's best-of-five grand final series opener to take back home-court advantage. 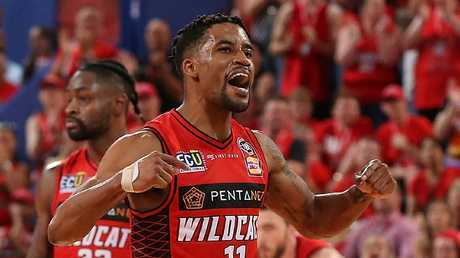 The Wildcats, the NBL's most successful franchise with nine titles, need only protect Perth Arena to clinch a 10th crown. The top-ranked team has won 20 of the past 40 NBL championships. But United remains upbeat ahead of the crunch game one despite dropping both games in Perth this season by small margins. 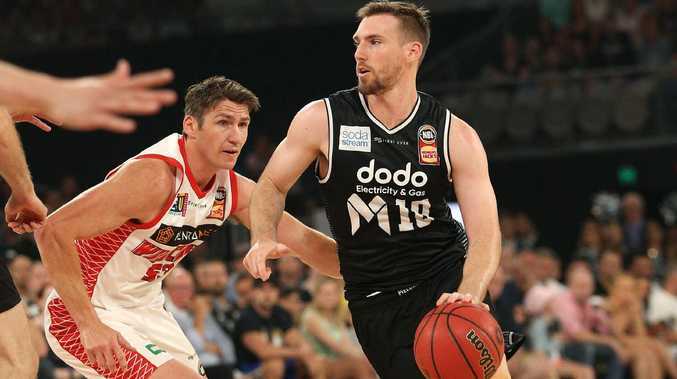 United star Mitch McCarron has warned against the reigning champions putting too much of a focus on Wildcats guard Bryce Cotton. "We can't let them get in a rhythm early," McCarron said. "Whether it is Cotton, whether it is (Terrico) White, whether it is Nick Kay … we can't let them feel good at home because that is when they just roll teams over. "Our biggest goal … I think, it's limit everybody." Bryce Cotton shapes as a key man for the Wildcats. A renewed focus on defence has powered United's championship bid, which started in explosive fashion last week. United obliterated Andrew Bogut's Sydney Kings in the semi-finals and a repeat of that will give Melbourne the best chance of becoming the first Victorian-based franchise to win back-to-back titles since inaugural winners, the 1979-80 St Kilda Saints. United guard Casper Ware will again be instrumental, at both ends of the floor. Ware splashed a franchise record 17 points in the first quarter last Sunday to sink the Kings. Mitch McCarron drives to the basket during the round 18 NBL match between Melbourne United and the Perth Wildcats at Hisense Arena. "It's finals time you got to step up," Ware said. "It's another level you have to go to (compared to the) regular season. That's what you expect from big-time players and that's I'm trying to do for our team." But Cotton is United's enemy No. 1, especially in Perth, having scored 31 and 27 in the two games in the west. "It's going to be a team effort though, they're (teammates) going to help me out, but I'm ready for it," Ware said. "I'm not going to worry about the head-to-head match-up. They end up getting more calls in Perth, he gets to the foul line more, it's one of them things you got to be smart about things and what you do and contain him as best as possible." Ware blanketed Cotton in Melbourne, holding the 2017 NBL most valuable player to 11 points in both appearances at Melbourne Arena.